A Hammam is similar to a steam room (think Turkish bath house) where Moroccans go habitually to cleanse themselves. I’ve since done a bit of reading on the subject (probably should have done that before going) and am super into the culture of the experience and am so glad I did it. Note that if you have a Hammam at a spa or hotel, know that you are A. probably overpaying and B. potentially not getting an authentic Hammam. But not everyone wants this type of experience or has access to it, so you do you. Now, the Hammam ritual is a series of cleansing and relaxing and socializing. Black soap (which can really be a shade of dark green) is used to soap and prep the skin, and a rough glove is used to exfoliate. Suds and scrub. And chat and catch up with your friends and family, for a Hammam is also a social gathering. 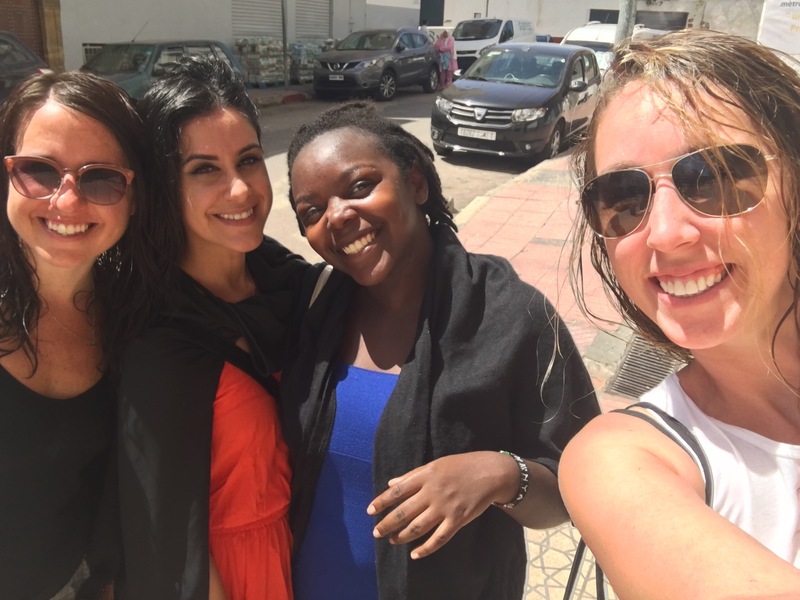 I went to the Hammam Marassa in Rabat with three of my Remote Year friends: Sam, Sara, and Immaculate. We entered a room that was tiled floor-to-ceiling with blue and white tiles, and after a few starts and stalls with my French skills, we paid, got our gloves and soap, and looked at each other shrugging, Well I guess we get naked now. Inside the bath house was two more completely tiled rooms, and the ladies who worked at the Hammam (I’ll call them our scrub ladies, who were mostly naked themselves) led us to the room in the back. It was hot and steamy, and walking naked through the first room we notice that we could have definitely kept our underwear on if we wanted. But mentioning this to Sara, she was all hey, we’re here, this is it. And I agreed – Let’s do the thing right. So there are 20 people in this Hammam of all age ranges who are naked or mostly-naked. I was shy for about 12 seconds. I’ve gone through multiple stages of hating my body and loving my body and scrutinizing my body and hiding my body and parading my body and working out a lot and not working out enough and eating too much and not eating enough, and currently I’m in a “I’m a little soft but whatever because I like pastries for breakfast” phase. Which means in those 12 seconds, I was self conscious in front of my friends, in front of the locals, and in front of our scrub ladies. And then Immaculate started naked dancing and our scrub lady started naked dancing and really, it was all okay. As a reminder, everyone is naked. And so, we sat down on the tiled floors and got sudsed-up with black soap and then scrubbed down so that mounds of dead skin were coming off. I wasn’t too surprised since I’ve been living in dusty Rabat for a month and have been to the Sahara and back, and I really needed a good scrub-down. The exfoliation was painful in the ‘hurts so good’ way. My arms, stomach, back, feet, chest, legs — everywhere visible was cleansed (again, we’re naked). Then we were rinsed with buckets of cool water dumped over our heads and I walked away (holding hands with my scrub lady) feeling brand-spanking new.